When Brad Pope returns to his boyhood hometown to confront his long-lost father, the 35-year-old psychologist becomes a prime suspect in the murder of cave diver, Big Jake Nunn. Whitecross, Florida, is known for its natural crystal-clear springs and underwater caverns where townsfolk die of natural causes, not murder. Until now. The psychologist's hopes of settling the debt with his father and reconnecting with his cantankerous Grandma Gigi are hindered by the surprised horror surrounding his father's whereabouts and sinister secrets of the Women's Preservation Club, founded by Grandma Gigi. 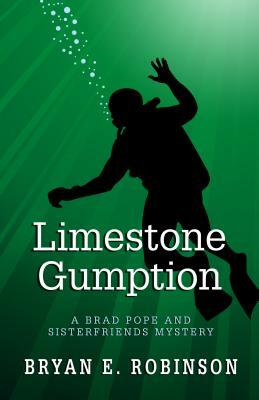 With its blend of humor and dark plot, Limestone Gumption witnesses beauty and brutality in a small Southern town. This fast-paced cozy mystery's twists and turns will keep you on the edge of your seat or make you fall out of it laughing.